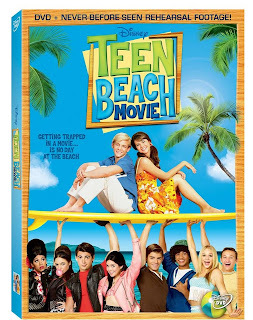 Win a Copy of Teen Beach Movie on DVD! Did your family miss out on the Disney Channel premiere of "Teen Beach Movie"? Here's your chance to win your very own copy! "Teen Beach Movie" introduces confident, resilient surfer McKenzie and her carefree boyfriend, Brady, a fan of the retro surf musical movie, "Wet Side Story." On the morning of McKenzie's planned departure for boarding school, she and Brady catch one last epic wave which mysteriously carries them right into "Wet Side Story," circa 1962, where they meet Seacat, Giggles, Rascal and Cheechee, among others. Amidst the spontaneous song and dance, there's trouble in paradise -- it's bikers versus surfers for control of the local hangout, but Mack and Brady unwittingly interfere with the movie's star-crossed plot, one that would pair a surfer (teen matinee idol Tanner) and a biker (Lela, the sister of Butchy, the biker gang's leader). Typical of the teen beach movie genre, a kooky subplot has mad scientists Les Camembert and Dr. Fusion scheming to alter weather patterns and take over the local hangout -- and then the world. One Canadian reader will win a copy of Teen Beach Movie on DVD. This is a quick giveaway so be sure to get in all your entries before it closes Friday night. Good luck! My niece who's 14 because she loves shows and movies like this. It's for my girls who are 7 and 5 1/2. They both love this movie and sing the songs all the time. Definitely my daughter who would immediately start learning all the songs and dances. I know that my daughter (12, almost 13) would love it! I would give this to my niece because I think she will love it! I would give this to my tween niece who loves musicals! I would give this to my oldest daughter because she seen this on t.v and loves it. I would give to my 13 year old daughter. She likes this type of movie. OMGosh, I'll be one step closer to "Mother Of The Year" if I present this to my girls!!! I'd give it to my niece T. She'd love this movie & it would be a fun 'you passed your swimming lessons' gift for her. I would give this to my 9 yr old daughter, she loves musical shows/movies.